Peter Melendy wrote of Cedar Falls "no more beautiful site for a city can be found in the West." As a businessman, railroad promoter, mayor and friend of education, Melendy did much to fulfill that vision of his adopted community. Melendy was instrumental in establishing the Iowa Soldiers' Orphans Home at Cedar Falls in 1869. In 1876, when the Home was no longer needed, Melendy was a prime mover in the successful effort to convert the building to use as the Iowa State Normal School, now the University of Northern Iowa. Melendy was mayor of Cedar Falls from 1895 to 1901, during which time the city acquired free postal delivery, a trolley line and a new city hall. He was also an important early historian and author of Record of Cedar Falls, The Garden City of Iowa, Fifty Years 1843-1893. 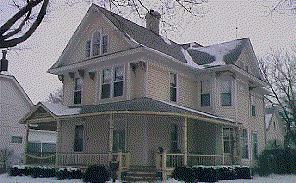 This house, built in 1886, was Melendy's second home in Cedar Falls. (The first is located at 1107 Washington Street.) The Queen Anne influence is evident in the cut-away corners forming a two-story window, the pent roof and other details. Leaded glass is still intact in the front door, the dining room and the living room. A beautiful carved staircase is in its original condition, with a built-in seat underneath. A later occupant of the house was Marion McFarland Walker, Melendy's stepdaughter. She lived in the house with her husband, Sam Walker, founder of the Cedar Falls Record.